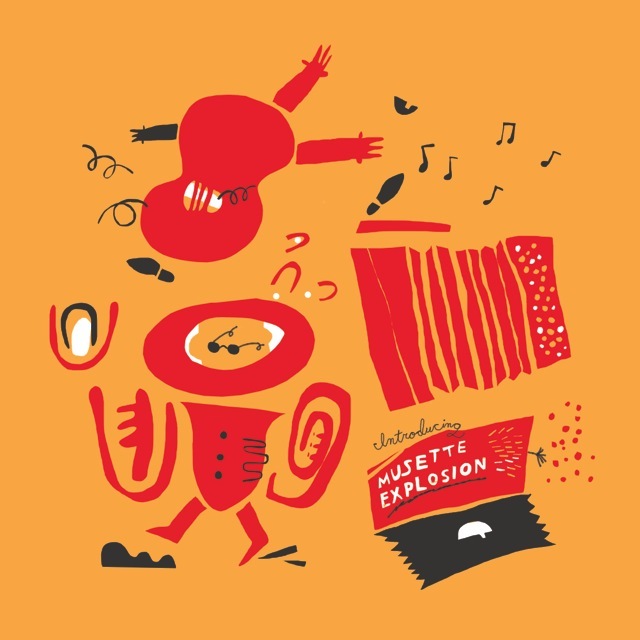 I know that I am not the only person who has been waiting for the first CD to document Matt Munisteri’s heartfelt study of composer Willard Robison’s music. The disc is finally here — STILL RUNNIN’ ROUND IN THE WILDERNESS: THE LOST MUSIC OF WILLARD ROBISON, VOLUME ONE. To listen to tracks from this disc, please click here. But we now have an occasion where all the pieces come into delightful alignment: a CD release show at Joe’s Pub in New York City on July 10, 2012, beginning at 7:30 PM. 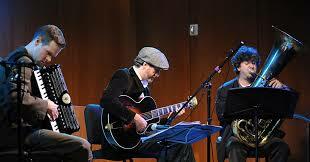 Matt will be joined by Matt Ray, piano; Jon-Erik Kellso, trumpet; Danton Boller, bass; Mark McLean, drums. During the mid 1920′s Willard Robison was working as a pianist and arranger with many of the stars of the new jazz vanguard when he went into the studio and recorded a string of startling recordings which almost certainly made him the prototype for the American 20th century’s most abundant and everlasting artistic archetype: The singer/songwriter. Before the deluge – before there was Hoagy, or Johnny Mercer, or Randy Newman, or Mose Allison, or Brian Wilson, or Van Dyke Parks – Willard Robison wrote, orchestrated, conducted, and sang his own utterly unclassifiable music and lyrics in a series of pioneering and timeless recordings between 1924 and 1930. His songs told of odd rural loners, wild open landscapes, revival camp meetings, preachers, and the devil (always the devil) and employed a complex and surprising harmonic and melodic language which, while referencing the new jazz – along with classical, ragtime, blues, and even old time country music – emerged at once as a fully realized and completely original American voice. Yet, in the years since 1930, and in the 42 years since Robison’s death, not one of these ground-breaking recordings has ever been re-issued after its initial release as a 78 record. Robison is virtually alone among seminal and much-recorded American musical innovators: the LP era passed him by; the CD era passed him by; the digital download era has thus-far passed him by. As Robison slipped deeper into alcoholism and an increasingly itinerant life the big companies who owned his music subsequently shelved these strange “unmarketable” works to the vaults, where they remain to this day. 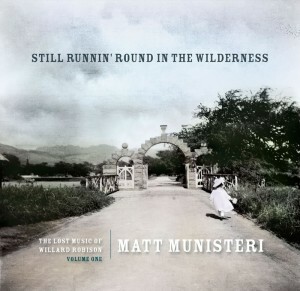 But this could soon change, and Matt Munisteri’s new CD “Still Runnin’ ‘Round in The Wilderness” may prove a catalyst for a long overdue interest in this timeless body of work. Lauded for his fiery guitar chops, literate humor, and “pre-war heart” (The New Yorker), the likewise unclassifiable ace guitarist, singer, and songwriter, Matt Munisteri has spent over a decade hunting down, transcribing, and performing these lost masterworks, refracting them through his own individual prism of 20th century American music. In the process he has not only finally brought these tunes to light, but has imbued them with an organic and riveting beauty in which jazz improvisation, folk traditions, and popular song co-mingle. Matt Munisteri has worked with many notables across the jazz and roots-music spectrum, including Mark O’Connor, Steven Bernstein, Loudon Wainwright, Jenny Scheinman, “Little” Jimmy Scott, Catherine Russell, and Geoff Muldaur. His 2003 release “Love Story” won the number two slot in Amazon’s Best Jazz CDs of The Year. Recognizing a rare kindred spirit, Munisteri became obsessed with Robison’s music around 2000, and the hunt for old 78s, worn tapes, acetates, and sheet music over the past decade has produced as many remarkable stories as the songs themselves tell. With a crew of top NYC musicians he has re-imagined Robison’s songs, culled from their original recordings, as a body of work rightfully freed from the trappings of era or idiom. The music was recorded live over two days, with all the musicians in a 15X18 foot room, with no isolation by John Kilgore – this is truly “Live” live, with nowhere to hide, and the resultant interplay among these master improvisers is the listener’s gain. The musicians include: Matt Munisteri – guitar, vocals, banjo; Ben Perowsky – drums; Danton Boller – bass; Matt Ray – piano; Scott Robinson – C melody sax, clarinet; Jon-Erik Kellso – trumpet; Will Holshouser – accordion; Rachelle Garniez – guest vocals. What Matt has done with and for Robison’s music is startlingly rewarding. It would have been one thing for him to consider his role as musical archivist only: find the obscure sheet music and 78s, and present them, either as cleaned-up copies of the original discs OR as reverent recreations in 2012 by musicians interpreting Robison as if he were Dvorak. That in itself would have been a splendid project, because listeners like myself would have been able to hear Robison songs they didn’t know (in addition to the “famous” ones: A COTTAGE FOR SALE; T’AIN’T SO, HONEY, T’AIN’T SO; LITTLE HIGH CHAIRMAN). But Matt knows that archival reverence has its limitations, so both the CD and his live performances have successfully gotten at the heart of Robison’s music creatively. Another artist’s deference to “the material” might have made it seem distant — museum pieces behind glass. Munisteri’s Robison, imbued with the force of two strong personalities, comes into the room and demands our attention. Now. I know that “re-imagining” makes some listeners nervous: will the original music that they know be stretched out of shape by artists eager to impose their own personalities on it? Will SUNSET CAFE STOMP reappear to a samba beat with sampling? Matt’s imagination is deep but nothing of the sort has happened here. What he has done is to present Robison’s music through his own lens — wry, soulful, amused, sad — presenting it by singing and playing, alone and with congenial musicians. The result is a new window into a series of intriguing worlds, where ethical truths are offered with sly wit, where deep feelings have sharp edges. The CD is masterful and repeated playings have only shown me its expanding vistas. And I’ve learned so much about Robison from Matt’s incisive writing in the notes. I propose that anyone who can go to the show and buy the CD: both will be rewarding experiences. And if we send out the right sympathetic vibrations, perhaps Volume Two will follow soon. I was first captivated by Peter Ecklund’s music before there were compact discs. In 1987, his bright cornet sounds came leaping out of the speaker as soon as I began to play KEEPERS OF THE FLAME, a Marty Grosz record (Stomp Off). Then I bought and treasured PETER ECKLUND AND HIS MELODY MAKERS — now happily reissued on CD as HORN OF PLENTY (Classic Jazz). But wait! There’s more. Let me break into this discography / memoir and add a soundtrack: click on http://www.peterecklundmusic.com/ for a charming musical background — Peter and friends playing his compositions and a few standard tunes. 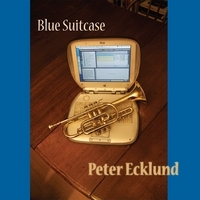 Here’s something even more encouraging: a new Peter Ecklund CD, called BLUE SUITCASE. It’s available at CDBaby as a download or disc: (http://www.cdbaby.com/Artist/PeterEcklund2) — for the ultimate musical experience, you can buy a copy from him at a gig. Peter Ecklund is a conjurer, a creator of musical moods that span time, place and idioms. In this collection of jazz/pop eclectica, a combination of Ecklund originals and reinterpreted/rearranged standards, he evokes eras and emotions with a startling clairvoyance: you never heard it before, you never heard it THAT way before, but it feels exactly right. And he does it with a unique methodology: the careful construct of skilled instrumentalists engineered to play as one with MIDI (Musical Instrument Digital Interface) files, all filtered through the operating system of an Apple computer. The result is BLUE SUITCASE—a technologically-assisted artistic vision, in every instance as musically astute as a dozen bands specific to their bookings. Take these revamped staples of early jazz: the once-rollicking romp San is a moody retro-tech visit to the dark continent, returned to sunny refrain by way of ukulele and clarinet. Dinah is hot as ever in a cooler sort of way, and technically brilliant in the hands of Ecklund and Block. The Broadway stalwart This Can’t Be Love here becomes an accordion-accented fugue for engaging trumpet and flugelhorn choruses, a succession of muted and open-horn improvs. On the lead-off non-original (but hardly un-original) in this set, secrets are exchanged between triangle, trumpet, accordion and ukulele. Old Madeira Waltz lulls with its laconic delivery and intrigues with its mysterious tone. Now witness Ecklund the composer as time-traveler in Tail Fins—top-down breezy, at once sweet and bittersweet—and so perfectly 1950s that the millennial stress starts to seep from your pores. Watching the World Go By takes you to the ’60s as surely as these boots are made for walking (and those doomsday disco riffs preceding a cheerful trumpet lead and plaintive vocal are precisely the mixmaster magic so prevalent throughout). Or timeless as a silver screen legend, when a well-played saw (yes, saw) evokes the angel-voiced end of a Warner Brothers’ melodrama with the propulsive melody of an Italian cinema score. Add a jazz-baby chorus, a vaguely yokel vocal incanting film star infatuation, and finish with a brassy Hollywood fanfare: a Love Sawng for the ages. irrepressible rhythmic bounce. For classicists…As the horns and accordion elaborate on Lazy Ragtime’s filigreed rhythms they are underpinned not by alternating bass notes and chords but arpeggiating strings. Of course. England, a forest in Eastern Europe, a ballroom in New York. Horn, accordion, Foxtrot. Romance. For everybody…The gentle thesis of Waltz for a Song is stated in muted brass, spun out open-voiced against a circular undercurrent, then returning home—as all good waltzes do—with straightforward yet intense exposition. BLUE SUITCASE meets the most iconic dance of all, and the benefits are mutual. And a word about that suitcase. If you’d asked me in other circumstances for my feelings about having a splendid jazz soloist accompanied by something technological, I would have become anxious. I’ve heard too many CDs where (perhaps for budgetary reasons) the “strings” come out of a box, and they bear the same relation to actual strings as dehydrated soup mix does to soup. But Peter Ecklund’s imaginative efforts here aren’t an attempt to offer imitations at reduced prices. Rather, Peter’s backgrounds and melodies that come out of the Blue Suitcase are evocative additions, swirling around the human players and singers: this CD is a ticket inside his imaginations, and that’s a wonderful gift. Besides, it makes me think of a famous Louis Armstrong anecdote. Someone had asked him (off the record), “Louis, how do you stand playing with bands where the musicians are well below your level?” And he’s supposed to have replied, “You start relying on other musicians and it’s too bad for you!” Peter’s surrounded himself with first-rate players on this CD: among them Dan Block, Will Holshouser, Andrew Guterman, Joel Eckhaus, Melody Federer, Christine Balfa, Murray Wall, Gary Burke, Marty Laster, and Matt Munisteri. And the BLUE SUITCASE, a most magical piece of luggage, by Peter’s side for these wonderful journeys. And — not incidentally — New Yorkers and intrepid travelers can now see Peter in person in a variety of settings: visit his site to see his current gigs, which include stints with the Grove Street Stompers at Arthur’s Tavern, with Terry Waldo’s Gotham Jazz Band at Fat Cat, with the Stan Rubin trio featuring Herb Gardner at Charley O’s, with the Stan Rubin band at Swing 46, with the Gotham Jazzmen at the Greenwich Village Bistro. Peter, incidentally, is memorably inventive in person, even when his luggage is in his apartment. To paraphrase Linus, “Happiness is a full gig calendar!” Details here: http://www.peterecklundmusic.com/?section=calendar — and you can join Peter’s email list to be kept up to date on these happenings.